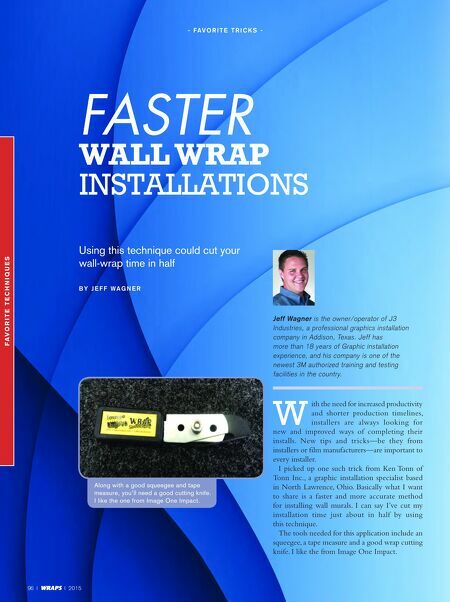 96 I WRAPS I 2015 Faster Wall Wrap InstallatIons - F a v o r i t e t r i c k s - Using this technique could cut your wall-wrap time in half B y J e F F W a g n e r W ith the need for increased productivity and shorter production timelines, installers are always looking for new and improved ways of completing their installs. New tips and tricks—be they from installers or film manufacturers—are important to every installer. I picked up one such trick from Ken Tonn of Tonn Inc., a graphic installation specialist based in North Lawrence, Ohio. 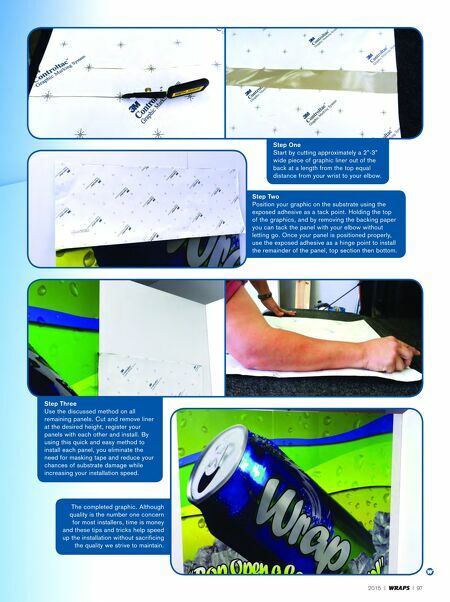 Basically what I want to share is a faster and more accurate method for installing wall murals. I can say I've cut my installation time just about in half by using this technique. The tools needed for this application include an squeegee, a tape measure and a good wrap cutting knife. I like the from Image One Impact. Jeff Wagner is the owner/operator of J3 Industries, a professional graphics installation company in Addison, Texas. Jeff has more than 18 years of Graphic installation experience, and his company is one of the newest 3M authorized training and testing facilities in the country. F av o r i t e t e c h n i q u e s Along with a good squeegee and tape measure, you'll need a good cutting knife. I like the one from Image One Impact.